The enzyme papain in the flesh and skin of papaya fruit actually breaks down dead skin cells and helps promote skin renewal when used topically on the face or body. Papaya facial treatments like this are a popular way to improve your skin’s texture, elasticity and appearance. They may also help with wound healing and burns and even assist in the treatment of skin problems like acne, blemishes and age spots. The enzymes in papaya, and especially the green fruit, can improve digestion by breaking down proteins into their individual amino acids. The proteolytic enzyme papain found in papaya is actually so good at breaking down proteins, it is used as a meat tenderizer commercially. Undigested proteins can lead to many health issues, such as gastrointestinal problems, autoimmune disorders, inflammation throughout the body and an overgrowth of flatulence causing bacteria in the colon. If you can’t find the fresh fruit then green papaya enzyme rich capsule like these are convenient to take with any protein meal. Papaya does make for a great dessert whenever you can get it though. There is much more on the surprising ways papain in papaya can benefit your health in the page on how papain enzymes improve digestion. Papaya health benefits also include good levels of two special compounds called lutein and zeaxanthin. Known as xanthophylls, these phytonutrients are concentrated by your body in the macular region of your eyes. Here they provide protection against both UV and high energy blue light that can damage our eye’s retinas and are involved in fine detail perception. Research suggests a good intake of both zeaxanthin and lutein can significantly reduce your risk of developing age-related macular degeneration (ARMD), the most common cause of blindness in America. The high levels of lutein and zeaxanthin in foods like papaya may also protect against developing cataracts, glaucoma, and other chronic eye diseases. Other good sources of lutein and zeaxanthin are pumpkins, spinach, broccoli and the yolks from free range eggs. Many people also report an improvement in visual acuity and color perception with high doses of lutein and zeaxanthin in supplements derived from natural sources. If you rely heavily on your eyes for long periods, particularly for detecting fine details like reading the words on a computer screen all day long, then an extra daily intake of lutein and particularly zeaxanthin may help significantly. While I eat a lot of xanthophyll rich foods, I’ve still personally noticed much less eye strain when working for long periods on my laptop since I started taking these high strength zeaxanthin, lutein and astaxanthin capsules made from marigold flowers. Ideally, they should be taken with a meal containing healthy fats to enhance their absorption as well. With breakfast eggs or avocado is a particularly good time. The health benefits of papaya can also be valuable for reducing your risk of developing certain types of cancers. Obviously seek the advice of a knowledgeable health care professional when dealing with any serious disease, but also know that nutritious foods can support your body’s natural defenses and healing. In the case of papaya, their rich antioxidant content, particularly lycopene, beta-carotene and another less well known carotenoid called beta-cryptoxanthin, are especially beneficial in reducing your risk of developing cancer. Proteolytic enzymes in papaya can help to break down the fibrin protein layer of cancer cells that usually surrounds and protects them. This leaves the cancerous cells more susceptible to your body’s natural immune response. It is also believed to hinder its growth and inhibit the cancer from spreading. Pawpaw fruit also contains compounds called isothiocyanates that may help prevent cancer by eliminating potential carcinogens from our bodies and enhancing the action of tumor suppressing proteins. Cruciferous vegetables like broccoli are an even richer source of isothiocyanates, but papaya is still a good source. 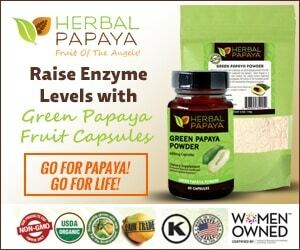 Recent research has even studied the powerful cancer cell killing effects of compounds found in papaya leaves. See the page on could papaya leaf be a cancer treatment for more details on this. Do you enjoy eating papaya and how do you like to have it? I personally find it to be both a great breakfast to start the day with and good for dessert after a big protein meal. I’d be interested to hear any questions you might have on the benefits of adding papaya to your diet in the comments below. Wonderful discovery of potentials for a fruit so Common and so undervalued, and wasting in our backyards! But among the various species, which is the best? Hi Omotayo. Thanks for your comment. There doesn’t appear to be significant nutritional difference between the different varieties from my research. The smaller Hawaiian varieties tend to be sweeter than the larger Mexican papayas though. Brighter colored pulp may also be an indication of more antioxidants. If you intend using the seeds for their anti-parasitic and protein digesting properties, the larger seeds in the Mexican varieties do seem to be more potent. See https://superfoodprofiles.com/surprising-health-benefits-papaya-seeds for more details. Dats great but i love d unripe on and strong. I mean not too soft and not over yellow. Pls wil it still be work as the ripe one? Hi Vivianne. The greener the papaya the more papain enzymes it has in it, which is very good for clearing out the intestines of undigested waste. The ripe papaya are said to have more antioxidants. Some of both would be ideal. Papaya also ideal for lose weight? The more healthy, antioxidant and nutrient rich foods like papaya you eat the less hungry most people tend to be, so yes I would think papaya could be beneficial for weight loss. if a cube of ripe papaya could be rubbed on face, along with honey provides instant glow n can also helps undo the tiredness all over the day. papaya is too good for skin. It was a young Indian therapist that suggested I take papaya for my incredibly sluggish bowel. Works like a charm. One day after eating, no problem, every time. But does anyone know if it will only work when I take it. Or is there any evidence to suggest that it could actually improve this chronic condition I’ve had as long as I can remember. What would be the best way to take it. And are there any other foods equally effective. Because eating just the one thing all the time is really boring! I’ve always enjoyed papaya, even before I knew how good it was for me. Different tastes I guess but it’s good to hear you’re having it now. Wow.., all dis is amazing! But I wanna know wat proportion or amount is appropriate to be eaten on a daily basis. You won’t ‘overdose’ on papaya so whatever you are comfortable eating is good. If you have easy access to this wonderful fruit then half a papaya in the morning makes a very healthy breakfast. This beneficial effect is likely due to the combination of digestive enzymes and natural fiber. Pineapple would be another good choice with similar properties and avocados, bananas and other tropical fruit are all likely to be helpful for improving bowel movements. papaya is always a miracle fruit for me,,it does wonder for my digestion and skin as well. 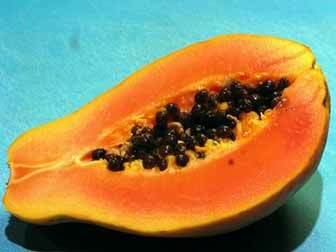 Papaya is considered excellent for gastroesophageal reflux. Having it for breakfast rather than cereal would be a good step towards loosing weight. In fact, anywhere in your diet you can cut back on grain based foods, particular bread and pasta, would be beneficial. Papaya’s are not acidic and are one of the most strongly recommended for this condition so I think it would be fine. You could try a small amount the first time and see how you tolerate it. As I mentioned, for breakfast would be a great time to have papaya. Thanks for your comments Jondel. Papaya is one of my favorite fruits as well. With all of it’s beneficial effects on health I’d really like to see it become a more common fruit in the supermarket. thanks but is papaya seeds able to cure hyppertitis B , if yes how will u take doe. I don’t know if you would consider papaya seeds a hepatitis cure, but the papain in them has been used to treat health problems from hepatitis like liver damage. I’d recommend discussing using them with a knowledgeable healthcare professional if you are suffering from the disease. I enjoy pawpaw together wIth pInapple anytime as a snack. They test nice. I want to try a piece of pawpaw and honey for facial skin. Ask me after three weeks. hi. Do green papaya enzyme capsules/pills work naturally in your body like papaya fruit.can you also use them for your skin,and can you use them and eat the fruit at the same time? Papaya enzyme capsules can be used as a digestive replacement but I wouldn’t use them on the skin. Hi Vivianne. The eco-friendly the pawpaw the more papain minerals it has in it, which is very excellent for cleaning out the digestive system of spend waste. The fresh pawpaw are said to have more anti-oxidants. Some of both would be perfect. I’ve actually never been aware of these amazing benefits of Papaya! Can’t wait to get some now, thank you. For a very simple, quick and healthy dessert you can cube papaya and marinate it with a bit of honey, lime and thinly sliced mint. Serve it over queso fresco (fresh cheese) and sprinkle with roasted sunflower and / or pumpkin seeds. So good! Yes! Finally something about papaya skin. I was first introduced to papaya in Jamaica in 2002 while at a resort. It was very good and it was suggested for me to put a little lime juice on it. I was hooked. Best fruit I have ever eaten. Now here in South Carolina I search the grocery stores for it all the time. I glad to know about the benefits this fruit has. Woww!!! Papayas U R awesome. Luvvv U. The best way I found to have papaya is in a smoothy. Mix with banana soy milk pear walnuts. I freeze it for the smoothy. Papaya should be beneficial as well but I’ve heard raw cabbage juice is particularly good for healing ulcers. How much quantity to consume to get the desired effect. I don’t think you need a huge amount of papaya in one sitting. It would be more beneficial to have it in smaller amounts more regularly. When it’s at a good price I often freeze extra for my smoothies and use around an eighth of a large papaya. Have you tried food grade diatomaceous earth? It kills intestinal parasites by dehydrating them. Within 24 hours I noticed a significant improvement in the regulation of the frequency of my bowel movements and other related improvement. I was having 4-6 movements per day along with the bloating, gas, and stomach pain all of which is now much more tolerable. I don’t do the laxative part as I don’t think that is needed. One question that I have is do you think it would be bad for my body to continue to eat 2 Tablespoons of Papaya Seeds every day without a break? I don’t mind the taste when in the smoothie and I have not noticed any side effects after 5 days of continuous use. Thanks for helping me to feel so much better. Thanks for your comments. This is another topic I would like to write about in future. Glad to hear the papaya seeds are helping. 2 tablespoons is a large dose. I’d go with the recommendations in the article https://superfoodprofiles.com/papaya-seeds-parasites but you can continue with them beyond the suggested time if you feel they are beneficial. That said, it’s always good to take a week break from natural treatments every month or two. Unfortunately I don’t think dried papaya would have the same benefits. Sugars tend to be concentrated while enzymes and nutrients diminished. I’m commenting here because the original page I wanted to comment on, the one with the parasite killing smoothie, is redirected to here. (I read this wonderful article too!) I don’t have a question, or anything I want help with. I would just like to say this is an amazing website and I am absolutely astounded by the wealth of knowledge you’ve put in here. I want to say thank you on behalf of all the people trying to find answers in this huge mess we call the internet. And that your efforts, all your research and time, is so greatly appreciated. I know everyone is responsible for educating themselves, but the work you’ve done to make this information more readily accessible to the general public is incredible. On top of that the comment section is a phenomenal addition of information. Thank you so much for taking your time to do additional research for people asking more questions. The world needs more teachers like you! Thank you so much for helping so many people improve their quality of life!!! Thank you so much for your positive comments Everynne. It is really great to recieve a message like this and I wish you all the best in your improving health. I am beyond excited to have read your article on parasites and papaya. Want to do the papaya smoothie first thing in the morning. My daughter and I have had pinworm symptoms for two weeks now. She was prescribed albendazole, but I’ve been told I must wait since I’m in my second trimester of pregnancy. For two weeks I’ve done the garlic clove, apple cider vinegar, pumpkin seed deal. Yesterday I discovered Dr Oz’s papaya seed concoction with honey and took a heaping amount (1/4 c this morning). Must be why I’m excessively itchy and not able to sleep tonight?!?! And what would be your recommended intake of the smoothie? Thank you so much in advance. Your site has already helped a great deal. Hi Marissa and thank you for your positive comments. Apologies for the late reply as I’ve been travelling. Unfortunately it would be best to wait before having too many papaya seeds when pregnant. As I wrote early in the article, and linked to here https://superfoodprofiles.com/papaya-enzyme-side-effects-warnings certain papaya enzymes in the sap are better avoided when pregnant and I don’t think the research has been done on whether they are in the seeds as well so I’d avoid them for now. I would have expected the other page on papaya seeds and honey to mention this as well. I’m sure it’s fine as the papaya sap is actually applied directly and in much larger amounts in traditional cultures than you would ingest but I would still recommend not having any more papaya seeds or green papaya enzyme at the moment. A bit unusual but one natural remedy I’ve heard of for pinworms specifically is crushed garlic applied topically to the outer ‘affected area’ before bed when they are most active. This may sting a bit but it apparently kills pinworms on contact so they don’t trouble your sleep. Hi Jim.i have started taking smoothie u shared on other page.it had papaya ,pineapple,papaya seeds,pumpkins seeds n few other ingredients. I started having intense pain on my right upper abdomen ,liver n gallbladder area after 1 hr or so having smoothie.i wasn’t sure n thought it’s part of healing crisis. Next day it happened again n pain intensity increased.i omitted cloves third day ,I was using more than advised.still had pain. Any advice plz ?does it means I have gallbladder or liver parasites?have u heardths kind of effect in anyone? Sorry to hear about your experience and apologies for the late reply as I’ve been travelling. You might be a bit sensitive to the enzymes in the papaya seeds. If you’d like to try it again I’d advise starting with a much smaller amount at the start as recommended in the article https://superfoodprofiles.com/papaya-seeds-parasites perhaps just half a teaspoon and slowly building up your tolerence from there. Leaving the cloves out for a while or just a small amount is a good idea too. Hope you are good. I actually wanted to comment on the page about papaya for parasite cleansing. But its closed, hence my comments here. I thank you for sharing something you found beneficial , with humanity. And I’m pretty sure, the comments of those who have being helped by your knowledge share, no doubt warms your heart. Fewer things give such joy. I’ve suffered from worm infestation but today is not the day for sharing my woes. I intend to prepare the smoothie ASAP. But I don’t have access to all the ingredients. So pls , I’ll just state what I have , then pls let me know if I’m good to go. I have papayas in abundance, pineapple ( I don’t really like pineapples),fresh coconut (I don’t have the dessicated one like you suggested), I have organic coconut oil, I have dry cloves not the fresh one. I don’t have pumpkin seeds here. So pls, how can I still make a smoothie that will still be potent enough all the same, to flush out the worms? Hi Leah and thanks for your positive comments. The papaya seeds are the key ingredient you need and the other ingredients are supportive but not essential. If you have pineapple some would be helpful, particularly the core. Dry cloves are fine. Pumpkin seeds are ok to leave out. The fresh coconut you could add or eat afterwards if you prefer. Coconut water would be a far better base ‘milk’ than dairy if you have it. As it says in the article, it’s good to have some experience with papaya seeds before taking the larger amounts in this smoothie. Perhaps half a teaspoon first with a meal with protein, followed the next day by a full teaspoon for a day or two. If these are well tolerated you should be ok with the tablespoon in the smoothie. As long as the castor oil says food grade or hexane free it should be fine (check with the drug store if in doubt) but make sure you’re home for a few hours after taking it as it really works. Regarding comments on the site I have to hold all of for in moderation to prevent spamming. Thanks for your positive comments Jeanne. Someone suggested I must consume papaya to improve my eyesight, since started eating it I have experienced terrible hedaches. What must I do? That’s an unusual reaction. You perhaps have an allergy to papaya fruit. Arugula https://superfoodprofiles.com/arugula-health-benefits and bok choy https://superfoodprofiles.com/bok-choy-health-benefits are other healthy superfoods with strong eye nutrients.